Winston Shepard needed two more rebounds for the first triple-double in San Diego State history, and then one. SAN DIEGO (AP) — Winston Shepard needed two more rebounds for the first triple-double in San Diego State history, and then one. The coaches let him know how close he was. His teammates were pumped, hoping he'd get it. The student section did a countdown, chanting, "Two more rebounds!" and then, "One more rebound!" The clock ticked under a minute in a rout against IPFW in the first round of the NIT. Ben Perez tossed up a 3-pointer that missed. Shepard grabbed it with 48 seconds to play to secure his spot in the Aztecs' record book. "I wanted to get it but I didn't want to get it in a selfish-looking manner. I just tried to make the right play," said Shepard, who had 10 points, 10 rebounds and a career-high 12 assists as the Aztecs ran past IPFW 79-55. Shepard, a senior forward, thinks he has another triple-double in him. The Aztecs host Washington on Monday night. "When I came here I really believed that I could do it," he said. "I have the ability to do that, affect the game in multiple facets. To be honest, this isn't possible if my teammates don't make shots and even more so if coach Fisher doesn't leave me in for the whole second half." Shepard played 36 minutes. It's not Fisher's style to let a player stay in for personal stats, but he said this merited it. "This game is not about stats," Fisher said. "It's about winning. But that's a special achievement that doesn't happen often anywhere. It's never happened here. When it presents itself in this fashion, let's at least give him a chance by letting him play. I don't know why it hasn't happened. Probably because it's hard to do." As the clock wound down, Shepard stood with the ball in one hand and his other hand held aloft in victory. Malik Pope scored 15 for the Aztecs (26-9), who played with good energy despite coming off a 68-63 loss to Fresno State in the championship game of the Mountain West Conference Tournament that left them out of the NCAA Tournament for the first time in seven years. "They smoked us like a salmon," IPFW coach Jon Coffman said. "We didn't have a flow tonight. That's a credit to what they did on short prep." IPFW (24-10) gave the Aztecs a bit of a wakeup call when Brent Calhoun blocked Dakarai Allen's layup attempt on the game's first possession and Max Landis hit a 3-pointer. Pope answered with a 3-pointer and the Aztecs pulled out to a 19-9 lead, with Pope hitting another jumper and Matt Shrigley making a 3. 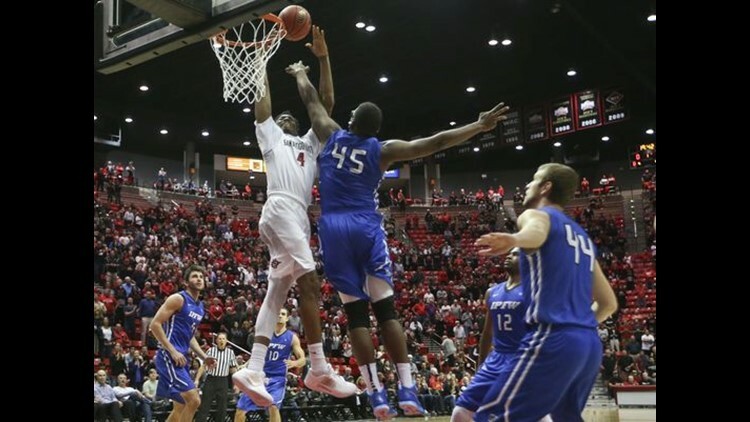 SDSU's length and athleticism were too much for the Mastodons. The Aztecs continued to stretch their double-digit lead to 40-22 at halftime. Trey Kell hit consecutive 3's and freshman Jeremy Hemsley also hit a shot from behind the arc late in the first half. Pope had a slam dunk late in the first half and hit a 3-pointer for the first points of the second half. Allen finished with 10 points for the Aztecs. Joe Reed scored 13 and Landis 11 for the Mastodons. IPFW: The Mastodons were making their NIT debut. San Diego State: The Aztecs reached the NIT semifinals in 2009 before losing to Baylor. San Diego State will host Washington on Monday night. The Huskies beat Long Beach State 107-102 Tuesday night.